EVOLUTION manufacture a range of cutting tools, drills and accessories for professional tradesmen and DIY enthusiasts. Renowned for their strength and reliability, EVOLUTION tools outperform other cutting saws and drills, cutting faster and cleaner with limited heat generation and leaving a workable finish when done. Chop and cut saws - EVOLUTION cut-off saws use patented RAGE® technology to easily cut through steel, aluminium, wood and plasterboard without the need to change blades. This makes them easier and faster to use than traditional chop and cut saws, while still providing an excellent finish with no visible burring or scorch marks. 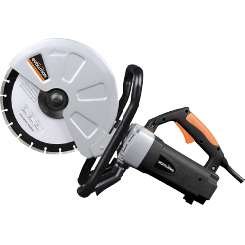 Compound and dual bevel mitre saws - Their mitre saws provide accurate cutting with less effort thanks to their powerful motors and high strength blades. Available in a number of different sizes for multiple applications, they offer excellent value and are suitable for both tradesmen and semi-professional users. Disc cutters - Evolution electric disc cutters are the ideal replacement for heavy petrol powered cutters. Lightweight and easy to handle, these electric disc cutters make easy work of concrete, stone, brick and paving slabs. Reciprocating saws - EVOLUTION reciprocating saws make easy work of metal conduit, copper pipe, plastic tubing as well as wood and plasterboard. With powerful high-speed motors and quick change blade functionality, they get the job done faster and with less fuss than other saws while leaving a nice clean finish to boot. Drills - Evolution manufacture a range of hammer and mixer drills suitable for DIY use and professional tradesmen. With high powered variable speed motors, EVOLUTION drills offer proven reliability and get the job done quicker than competing drills. Accessories - We supply a complete range of replacement cutting blades for Evolution saws. These high-quality blades are available for wood, steel, and concrete and can be supplied in a number of widths and teeth counts, suitable for all professional and DIY applications.